Environmentalists have often criticized wind turbines on the grounds that they harm wildlife such as birds and bats who are caught in the blades. On the other hand, home owners have cited turbines as eye-sores that reduce the value of their property. Now, it appears that the wind turbine controversy is about to taken to a whole new level as researchers at Loughborough University in the UK announced that by painting turbines a different color, rather than the traditional white/grey, wildlife might not be affected. In short, they suggest that all turbines be painted purple. We know what you’re thinking – bats are blind, so how does changing the color of the turbine affect them? Well, according to the research team, the bats are drawn to insects, which are reportedly affected by the color of the turbines. 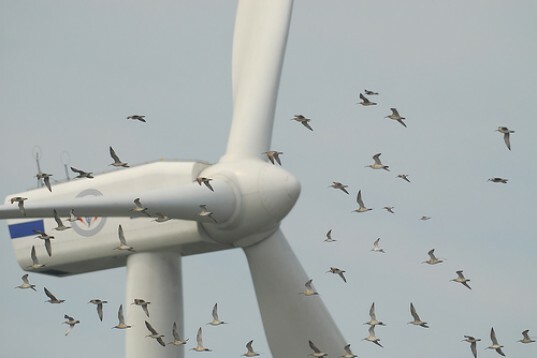 “It had been speculated that insects may be attracted to turbine structures for some reason and this then could attract insectivorous species, such as birds and bats, to forage in the vicinity,” said PhD student Chloe Long. “However no other study has looked in detail at what specific insect species might be attracted to turbine installations or why”. In order to reduce environmental collateral damage, the research team studied how insects are lured by specific colors on a wind turbine’s blade. Using the colors pure white, light and dark grey, sky blue, red, and purple, the research team laid out colored cards in a random sequence next to a 13m-high three-blade wind turbine situated in a meadow near Leicestershire, UK. They found that insects shied away from the color purple, however the team is quick to say that not all turbines need to be painted this color (something that will please home owners). It does show that changing the color of a wind turbine, can encourage local wildlife act differently. The researchers also found that the ultraviolet and infrared components of paint color, which humans cannot see but insects can, also had a significant impact, with higher levels of UV and IR components attracting more insects. “Our major conclusion from this work is that turbine paint color could be having a significant impact on the attraction of insect species to the structure, both during the day and at night,” Miss Long told the BBC. The results of the team’s research can be found in the latest European Journal of Wildlife Research. Bats are not blind. that is a myth. Other than that, great idea! On Wolfe Island in Lake Ontario, a large number of birds, including endangered raptors have been killed by the turbine farm there. http://windconcernsontario.wordpress.com/2010/06/10/wolfe-island-windfarm-turbines-deadly-for-birds-bats/ The number is MUCH larger than predicted by TransAlta Corp., the Alberta-based energy giant that owns the Wolfe Island wind farm, The company insists that the death rates for birds and bats are "within industry norms". According to results presented in "Current Biology" and other scientific sources, bats are killed by blood vessels in their lungs that burst due to the air pressure difference created by spinning turbine blades. Perhaps purple paint will help. What's clear, however, is that more studies have to be done and accurate facts presented before more turbines are built in important bird areas. This was very interesting, thank you for the post. Why was this study done? AWEA and CanWEA both say that independent studies have proven that there is only 1 bird death/per year per turbine? And there's lots of bats. They have hardly any impact at all on the environment..... do they not? We need to get off oil and use wind energy..... do we not? Wind turbines are clean. They don't make noise. They don't kill birds.... or bats. And they increase property value and tourism...... do they not? And they create green jobs and help the economy...... do they not?